Anyone up for a spicy dish? 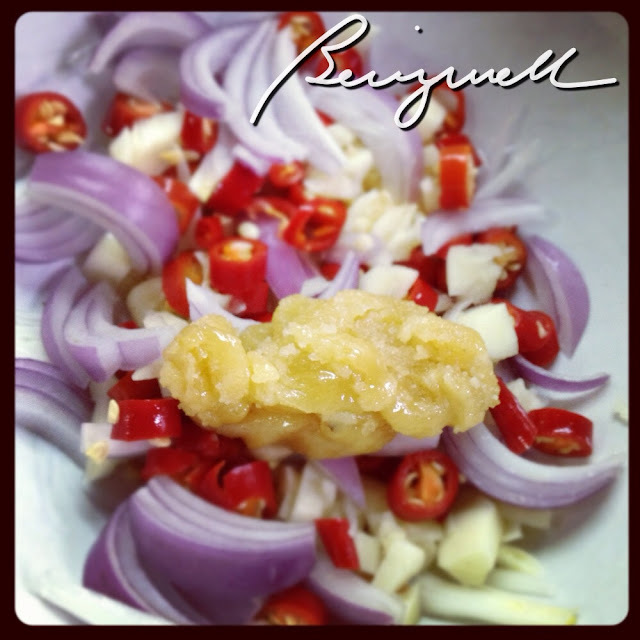 I'm cooking crispy morning glory in this post. 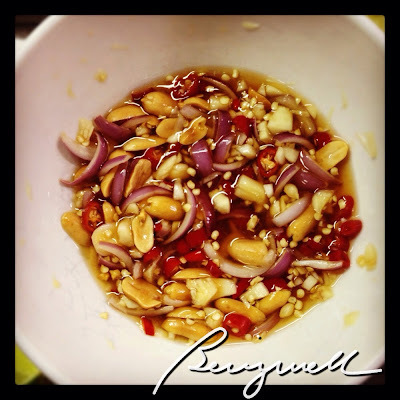 Aside from somtam (papaya salad), this is my next favorite Thai salad. It's refreshingly spicy! 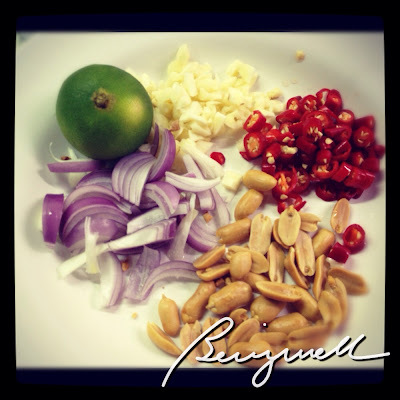 Read on to get this authentic Thai salad recipe. Morning glory is known for so many names - Chinese spinach, water spinach, water morning glory and kangkong to name a few. For the purpose of this post, we'll call it morning glory. 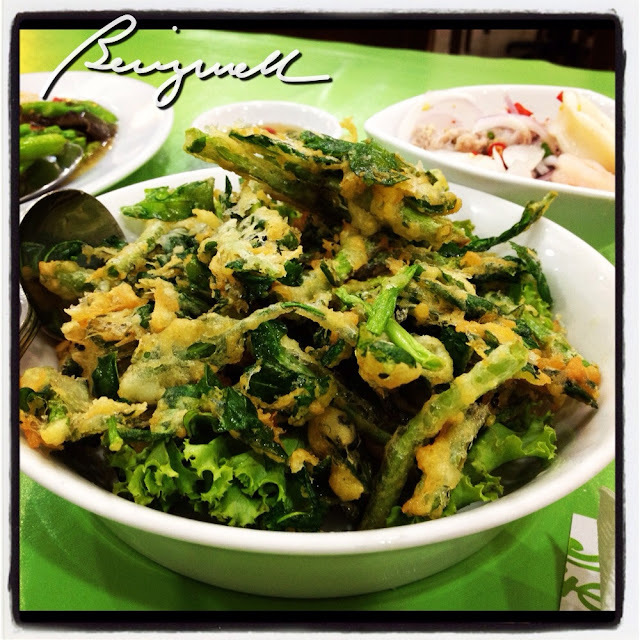 Thais call crispy morning glory salad "yum pak boong krob". For the likes of me, I just can NOT say it properly. I simply point to the photo each time we order crispy morning glory salad. To be honest, cooking crispy morning glory took a lot of my energy. I didn't know how difficult it was to make the morning glory crispy. (The trick is to to let them cook until the flour solidifies. a-hem...) It's all worth it though because I was able to mimic (somehow) it's taste when I eat them in Thai restaurants. If you're an adventurous cook, you'll be adding a feather to your chef hat when you try serving this at home. Let's start cooking crispy morning glory. 1. Prepare the crispy morning glory salad dressing. Add the following in a deep bowl. 2. Mix well until the palm sugar is dissolved. Set aside. 3. Blanch the shrimps. Set aside. 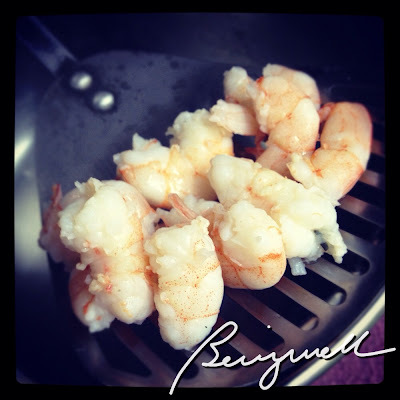 In cooking shrimps, avoid leaving them too long in hot water to prevent shrinking. Once they change their colors, they are cooked. 4. Coat the morning glory with cornstarch or flour. Add a little water to make it stick. 5. Fry the morning glory in a very hot pan, as if cooking tempura. When fried, the volume of the morning glory will deflate. If you want to have more servings, coat more morning glory. 6. Using a strainer, drain the morning glory off its oil. 7. 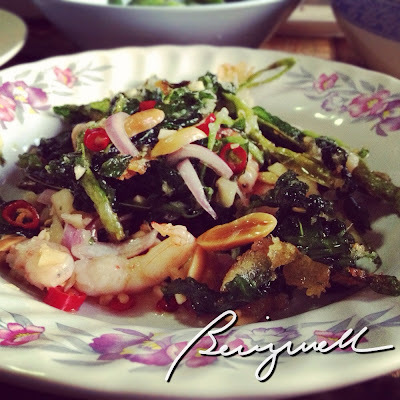 Mix the shrimps, sauce and fried morning glory in one plate. 8. Serve as a side dish on a separate plate or an appetizer. I hope you enjoy this spicy Thai dish. You'd love the crunch of the nuts and crisp of the morning glory as they swim in a sweet, salty and sour base. Simply yummm! Looks spicy! I'll try this one soon, although I'm not sure if my dad can handle the chillies, hehehe... btw, are you based in Thailand? Studied and worked there, many years ago. wonderful recipe, easy to follow. 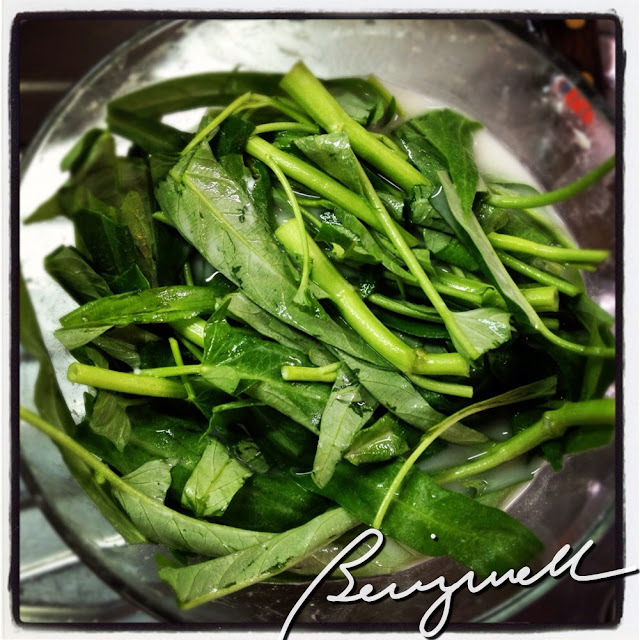 We have lots of kangkong in our backyard, so this is a must-try!!! looks delicious! unfortunately, i'm a pretty bad cook. :) i'll give this to my dad though - sya kasi mahilig magexperiment. That's an interesting Salad. I may try making one. 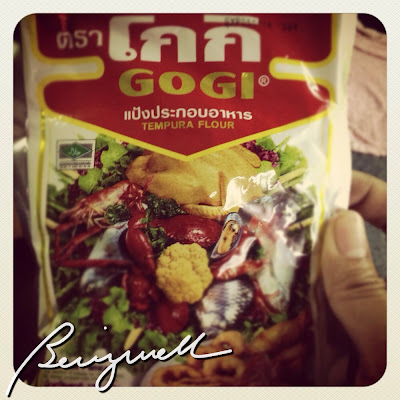 I miss Thai food and the tempura flour.I can't find any kangkong and tempura flour here. with food being serve instead of me preparing for it.. hahaha!